Over the 4th of July, my wife's extended family from Boston hosted a family reunion at their cabin in Maine... Kari'd never been to the state, and I hadn't been since I was a kid, so ... duh ... we went! 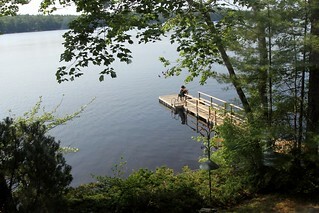 I'd forgotten just how beautiful and untouched a lot of Maine is. Flying into Portland and seeing the hills, trees, freshwater lakes, and ocean along the way made me seriously question why we live in Iowa. It is such an amazing place. So, once Kari and I landed, her parents picked us up and we headed past the small town of Damariscotta and onto Biscay Pond ... Lake to meet the rest of the family. Here, we had 2 cottages and her family's cabin... all split amongst 20+ people. Everyone in her family was awesome and the east coasters were all amazing hosts. We spent the next few days hanging out, eating, drinking, playing lawn games, and exploring the lake. There was lots of boating, swimming, kayaking, paddle boating, canoeing, and stand up paddle boarding. Kari even tried stand up paddle boarding for the first time and did great. But really... what I really want to talk about was the main(e) (haha, nailed it) event. I'd never seen anything like this. We had about 40 lobster, a ton of clams, veggies, steaks, etc - all cooked at the same time. Here's how it worked. First, we bagged up all the steamers (clams). Then we added a bit of water and a wire mesh frame to this giant stainless steel tub that sat above a fire pit. This is the base of what is essentially a giant steamer... and from that point on, we'd basically be building a seafood lasagna - using buckets of seaweed as noodles. The seaweed helps keep everything in place, disperse the steam and also adds more flavor. So first, we put down a layer of seaweed. On top of that we pack in as many lobsters as we can... but we can't fit all 40, so we add another layer of seaweed and more lobsters. On top of that goes more seaweed and a bunch of veggies - corn, potatoes, onions, etc. Then comes more seaweed and the clams. Finally, we add more seaweed, a carton of eggs, and even more seaweed. The carton of eggs was super interesting to me. Their sole purpose is to be a failsafe sanity check. When you think the lobsters are probably done, you pull out an egg and crack it. If it's hard boiled, your food's done! So once the seafood lasagna was constructed, we sealed everything up with plastic wrap and a tarp to trap all the steam in and lit the fire. 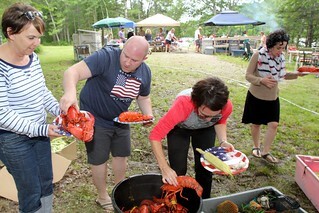 On the side, we had what would normally be the main event (well, at least in the midwest), but next to this lobster bake, it was quite boring - a grill full of awesome steaks. Fast forward about 45 minutes, we checked the eggs, pulled off the lobsters, and had a straight FEAST. It was so awesome. I'm so glad we were able to fly out east for this meal alone. Aside from all the lakeside activities, we ventured out a couple times to explore... and of course, eat more lobster. We spent one afternoon in Boothbay to go sailing and shopping, which was a great time. And then brought home some McLobster Rolls... That's right... McDonald's sells lobster rolls for $7.99 in Maine. We spent another afternoon checking out the Maine Brewing Company - a small, solar powered, and fantastic microbrewery in Freeport... And after a round of samples, we of course wanted more lobster, so we made a pit stop at the famous Red's Eats... and stuffed our faces. Each one of these rolls has at least 1 entire lobster on it... which is probably why they cost like $20 a pop. So good. So yea, Maine was great. It was beautiful, hanging with Kari's family was fun, and we went ALL IN on the lobster eating (and lobster drinking). I'm already looking forward to the next east coast family reunion.